Whales, the gentle giants of the ocean, are a curious and majestic group of animals. There are many species of whale -- it’s incredible to think of the differences between aggressive, fast orcas and slow, lumbering blue whales. Whales have intriguing social structures complete with communication, societal roles and the raising of young over a long period of time, making them similar to humans in more ways than you might initially think. The complexities of whale relationships are evident in the way they raise their young. The birth of a new baby whale, known as a calf, usually occurs during the birth season for that specific type of whale. Orcas, for example, tend to give birth in the spring or fall, while blue and humpback whales do so in the winter. 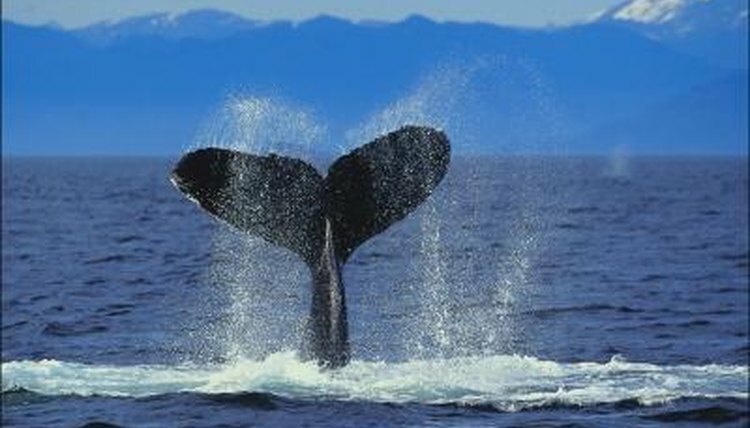 Gestation also varies from whale to whale -- with orcas it lasts around 17 months, with humpbacks 12 and with blues 11. Almost all whale births are to single calves, but rare twin births have been observed in wild whales. Whales, like humans, spend a great deal of time nursing their young. Killer and humpback whale calves nurse just a few hours after birth and continue to do so for a year or more. Killer whales nurse at all hours, but only for a few seconds at a time. These brief nursing sessions add up to an average of 90 minutes each day. Blue whale calves drink 100 gallons of milk every day for the first seven months after their births. Calves stay close to their mothers while nursing and learning their way around the sea. Different whales have different approaches to the concept of community and family. Toothed whales, such as orcas and dolphins, live and hunt in large groups known as pods. These pods often share the responsibilities of caring for and protecting new calves. Baleen whales, like blue whales and gray whales, tend to travel either in smaller pods or completely solo. Whale calves also reach maturity at different ages depending on their species -- it takes blue whales 10 years to mature, while killer whales can mature in as few as six. A new calf’s life is hectic from the get-go: Calves are born swimming, and most are immediately aware of the presence of their mothers and the pod around them. Calves are capable of exploring without the aid of their mother within a few days depending on species, but whale mothers will keep the calves in close proximity to prevent them from becoming lost or risking a predatory encounter. Though whale calves are weak at first and must swim in their mother’s slipstream to keep up, they grow quickly. Orcas, for example, put on around 1,000 pounds in their first year of life.